721 | What Does 721 Mean? 721 means "Love You". The 7 represents the total number of letters in the term. The 2 represents the number of words, and the 1 tells us that the term has one meaning. 721 is a form of shorthand typically used in texts or instant messaging. It also allows the speaker to say "I love you" without suffering the embarrassment felt by some (particularly men) when saying those words. 7 (seven letters) 2 (two words) 1 (one meaning). Person A: Love you lots! 721 is classified as a cyber term as opposed to an initialism abbreviation or an acronym. Initially, cyber term terms were introduced for brevity, but, particularly with the advent of predictive texting and on-screen keyboards, they are now mostly employed for fun. Cyber terms differ from icons because they are not pictorial representations. 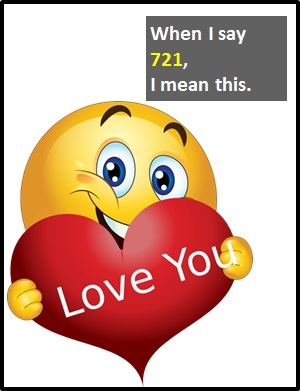 Before the digital era, we would have just said "I love you" instead of 721.